While I have an extensive cookbook collection that requires weeding in the range of 30-50 cookbooks every few years, I rarely use these cookbooks for cooking. I read them, inspired by great food writing and infused with new knowledge of different flavor combinations and cooking techniques. There are three exceptions to my not-cooking-from-the cookbook rule: the Barcelona Cookbook by my friend Andy Pforzheimer, David Chang's Momofuku, and now Jerusalem by Yotam Ottolenghi and Sami Tamimi. Jerusalem is an exceptional cookbook, a book that comes around only once in a blue moon. It manages to capture with much love and respect the melange of cultures, religions, and food that characterize a city mostly seen through the lens of conflict. I couldn't help but cook from this cookbook to experience for myself this vibrant, colorful world through Ottolenghi's eyes. Today's adventure was turkey-zucchini patties seasoned with cumin, cilantro, and mint. 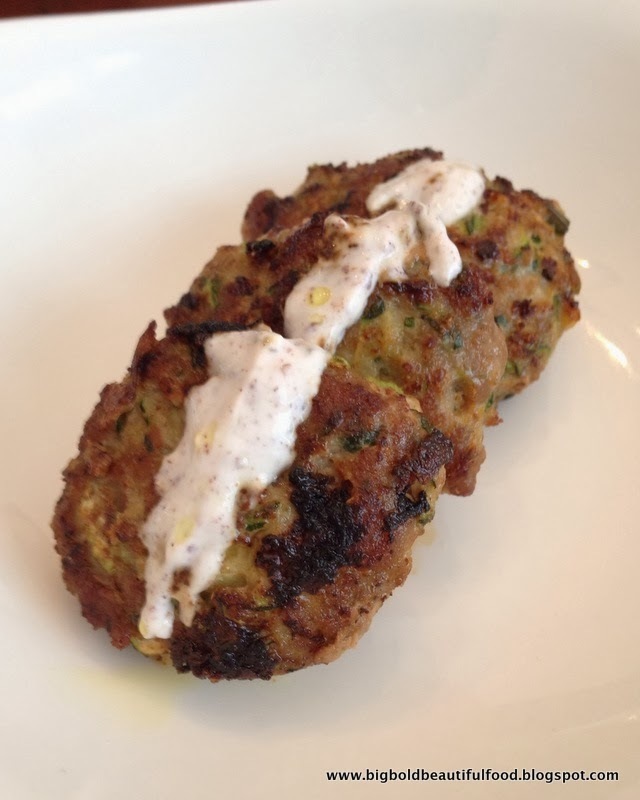 The shredded zucchini adds moisture and makes the patties juicy and tender. I particularly enjoyed the sour cream and sumac sauce, lemony and fresh. I don't use sumac all that much in my cooking, but I believe it will play a bigger role in my kitchen from now on. I'm not that familiar with Middle Eastern food, other than going to Layla's Falafel, a local eatery where I live. I've been bowled over with Chef Ottolenghi's cookbook, Jerusalem, however, so I want to learn to make this delicious and fresh food at home. I went and bought preserved lemons, sumac, and Greek yogurt, to add to the za'atar, tahini and dried chickpeas I already had in my kitchen. Today I made Ottolenghi's basic hummus and his lamb kofte, which is flavored with warm spices like allspice, cinnamon, and nutmeg. 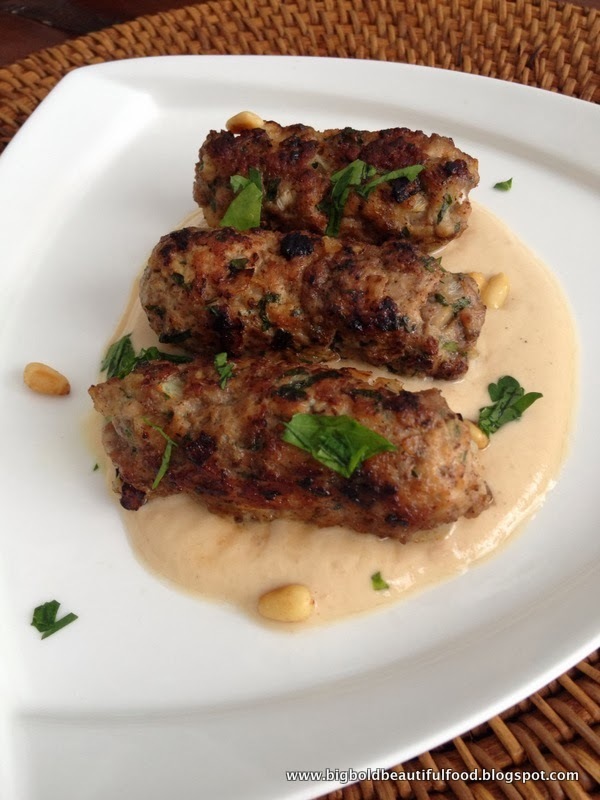 We ate the kofte wrapped in a warm pita slathered with tahini sauce, diced cucumber and tomatoes, and sprinkled pine nuts. My family declared it delicious. I am currently obsessed with Chef Yotam Ottolenghi. For Christmas, my sister-in-law gave me Thomas Keller's French Laundry Cookbook. Since I had it already, I returned it and decided to get Ottolenghi's first cookbook, Ottolenghi. I was hooked. I immediately ordered his other two cookbooks, Plenty and Jerusalem, and that was it. I was gone -- hook, line and sinker. What gets me about Ottolenghi's cooking is that he makes vegetarian food fun. I've always been one of those hard-core carnivores, even though I wished I could make it through Meatless Mondays. I've always been a bit prejudiced about vegetarian food, thinking it carb-, dairy-, and cheese-filled fare. I'd rather have bacon. Ottolenghi's vegetarian recipes captivated me with their vibrant and flavorful personality. The veggies are the stars instead of carbs or cheese with veggies as an afterthought. They are not goopy. These green pancakes are a great example of Ottolenghi's genius. 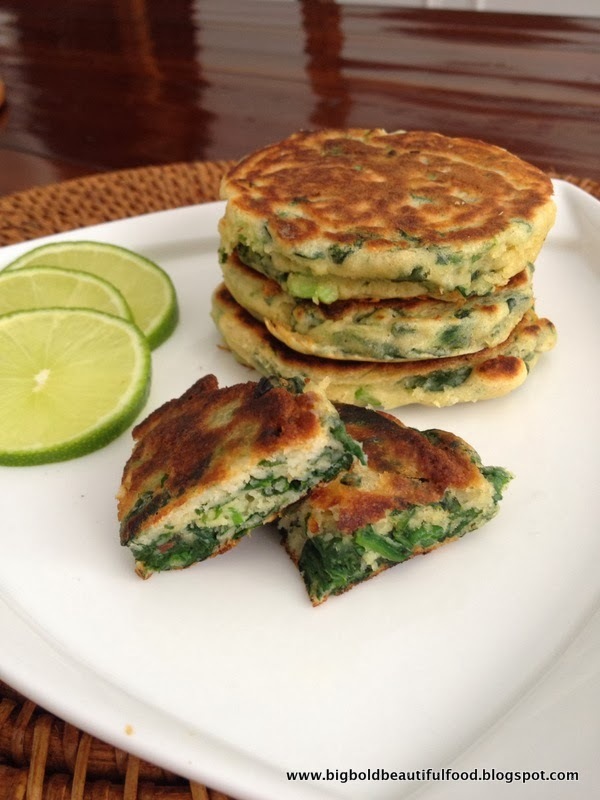 Light and filled with scallions and spinach, Ottolenghi accents these with a lime butter. I opted for a squeeze of lime juice, and they were scrumptious. When I was a kid, we used to say, "I love it so much, I would marry it!" 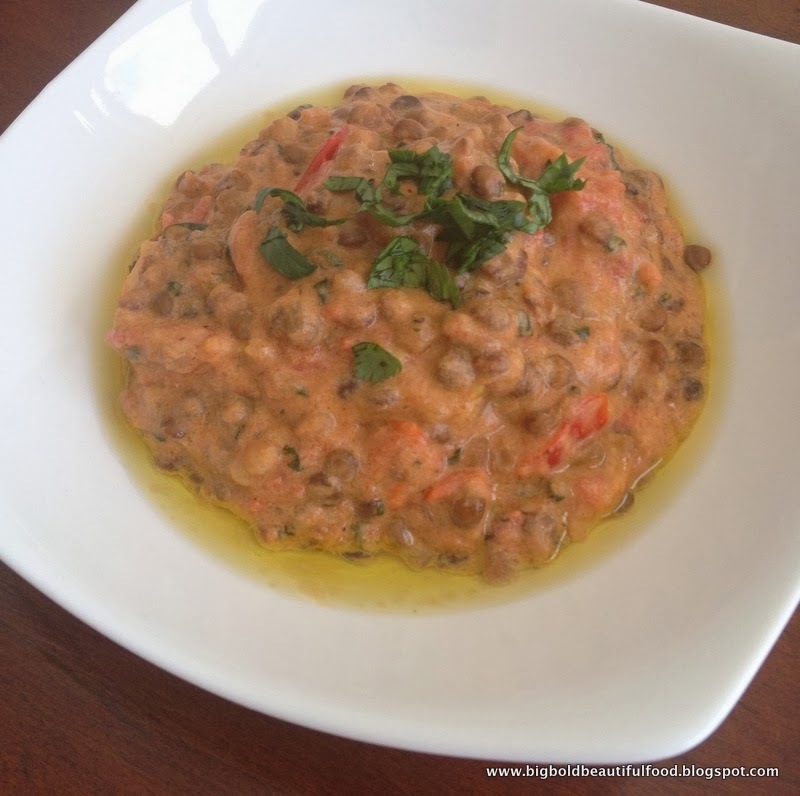 I would marry these lentils for sure. David Levowitz, whom I follow on Facebook and Twitter, posted the link to Yotam Ottolenghi's lentil recipes in the Guardian. I had just received Ottolenghi's eponymous cookbook for Christmas, so I clicked on David's link and fell in love. I went straight to the kitchen and whipped this up in minutes. One taste? Divine. 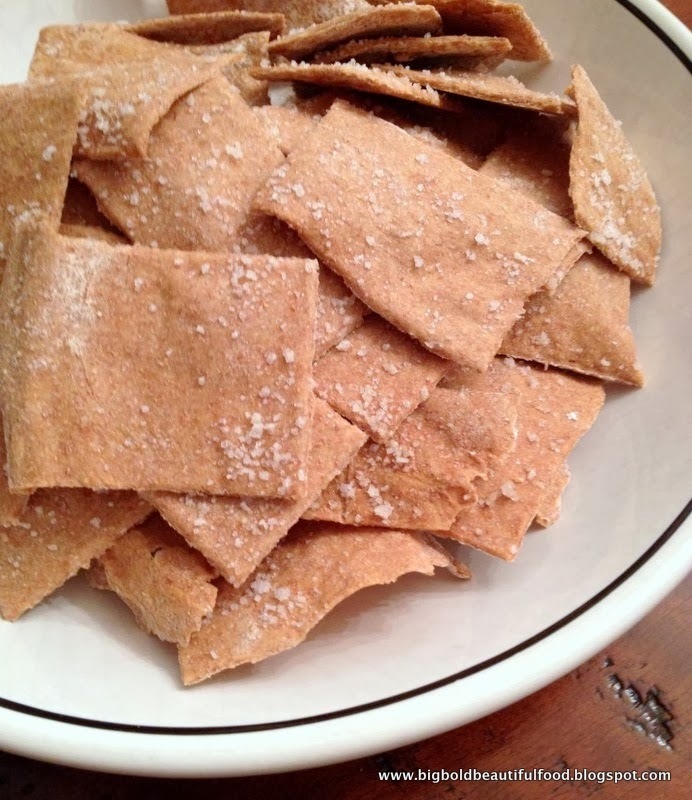 We wolfed it up with Mary's Gone Crackers and Stacy's Pita Chips. It's very filling and can be eaten as a meal or as a side dish. This appetizer is a huge hit in my friend Rachel's house and a favorite appetizer for dinner parties. Elegant and colorful, yet easily made, it's a lovely starter to a fun evening with friends. One bite of the crisp toast, lemony asparagus, and milky ricotta, and you'll be hooked. Preheat the oven to 350° and lightly brush a baking sheet with olive oil. Using a 2-inch round biscuit cutter, stamp 4 rounds out of each slice of bread and transfer to the baking sheet. Lightly brush the rounds with oil and toast for about 15 minutes, until lightly golden and slightly crisp. Meanwhile, in a medium skillet, heat the 2 tablespoons of olive oil. Add the asparagus, season with salt and pepper and cook over high heat, stirring occasionally, until crisp-tender, about 1 minute. Add the lemon juice and let cool slightly. In a small bowl, stir the lemon zest into the ricotta and season with salt and pepper. Spread the lemon ricotta on the toasts and top with the asparagus. Drizzle with oil and sprinkle with salt. Serve right away. My school recently did a cookbook, compiling favorite recipes from families. Apparently, fried ramen noodle salads are all the rage, given all the ramen noodle-involved submissions in the cookbook. I have never had this type of salad before, but I guess I have been living in the dark ages. This salad is about contrasts: crispy noodles against tender shreds of chicken, the sweetness of sugar vs. the tartness of vinegar, the pungency of scallions a counterpoint to the neutrality of iceberg lettuce. When looked at in this way, the salad has endless variations and substitutions. You need only your imagination to jump from this starting point to a fresh salad that works year-round, from a light summer salad to a hearty winter offering. Instead of lettuce or with lettuce: shredded napa cabbage, red cabbage, carrots, celery, kale, edamame. Instead of ramen noodles: fried wonton strips, fried onions. Instead of almonds: pecans, walnuts. For sweetness: dried fruit, manadarin oranges, shredded mango. For my salad, I added shredded carrots and dried cranberries for color and texture. As for the salad dressing, you can start with a ratio of 1 part sugar to 2 parts vinegar, as is noted below. You can add a little sesame oil and/or soy sauce. A little mayo if you want it creamier. You can also add sriracha, a garlic-chili sauce to provide some heat. Combine lettuce, green onions, and chicken in a bowl. Set aside. Break up ramen noodles, using 2 packages instead of 1 if you want more crunch. Preheat a skillet over medium heat. Melt butter in the skillet and add broken up noodles, sesame seeds and almonds. Stir until gold brown, careful not to burn the noodle mixture. Cool on paper towels. Please note that the noodle mixture can be made the day before and stored in an airtight container or Ziploc bag. Whisk dressing together and toss with lettuce, chicken, and green onions. Just before serving, add crunchy noodle mixture and toss. Serve immediately.